Spring isn't just about the birds and the bees. Spring, for parents of children everywhere, is also about year-end activities, and for parents of performers, that usually means a lot of activities. If we measure this as an eight-day week, running Saturday to Saturday, Calvin had six performances. That's one choir gala (Saturday), one tap assembly (Monday), one band concert (Thursday), one play (Friday), one talent show (Friday), and one piano recital (Saturday). The week kicked off with the Boychoir of Ann Arbor Gala 30th Anniversary and Farewell concert. It was a special one for our family because Jon was a part of that choir thirty years ago, and Calvin is the first performing child of an alumnus. The concert was a beautiful program, and because some numbers included alumni, both of my boys sang, and both of them had solos that they knocked out of the park. I can't quite describe how eagerly I awaited this concert, or how much I enjoyed it when it arrived. The tap performance was actually a dance demonstration assembly put on at a local elementary school (coincidentally the school Jon attended in his youth) by Calvin's dance studio. Since it was during the day not all of the kids in the class could participate, but the bare bones dance was a special treat for Jon and me because the studio's spring recital will take place during the Sunday matinee of Calvin's YPT show, meaning he'll miss it and we won't really have a chance to see him perform what he learned in either tap or ballet this year. Thursday night was Calvin's first band concert on a stage. I realize I sound here like the Olympic announcers looking to hyperbolize everything, but his very first ever band concert ever was in the gym during school hours, his first major band concert ever was in the bigger high school gym along with all the other area bands, now this is his first band concert on a stage. It makes a difference. So did the year of learning and practicing. Friday's performances, the play, then clarinet and piano in the talent show were with our homeschool group, so they were pretty low key. Nuff said. 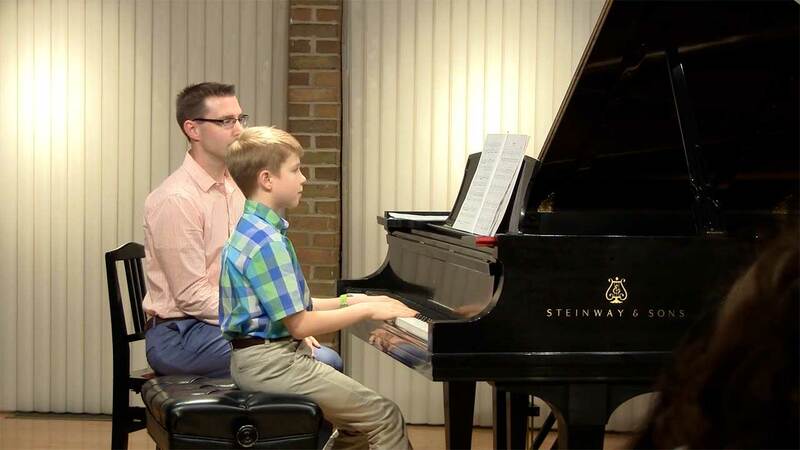 And lastly, on Saturday was Calvin's second ever age 10 spring piano recital. Second ever because last year the spring recital took place after his birthday, more in the summer, really, so that makes this his second age 10 spring piano recital. And he just about nailed it.